CLEAR TEMPERING GLASS: Shatterproof glass! Not like simple glass which will break to piece easily, our tempering glass is clear as well as shatterproof. The edge is smooth and will not hurt you. ELEGANT DESIGN: Our black picture frames fit 11 x 14″ photo without mat. PREMIUM MATERIAL: The wooden-frames are made by selected pinewood. For displaying the picture better, our mats are made by thick cardboard, which making all of the printing pictures can be displayed clearly and artistically. 1 x black wood frame, 2 x mats, 1 x double side photo, protective packing, wall mounting material. * 1 x wood frame fit 11×14 inches (27.9 x 35.6 cm); Frame whole edge size 12.1 x 15.1 inches (30.7 x 38.4cm), 0.78 inch (2cm) thick. * Frame material is pinewood, the edges are smooth and neat. * Clear, smooth and shatterproof tempering glass. * Free desktop standing or wall hanging. * Brand “ONEWALL” has been registered and protected. 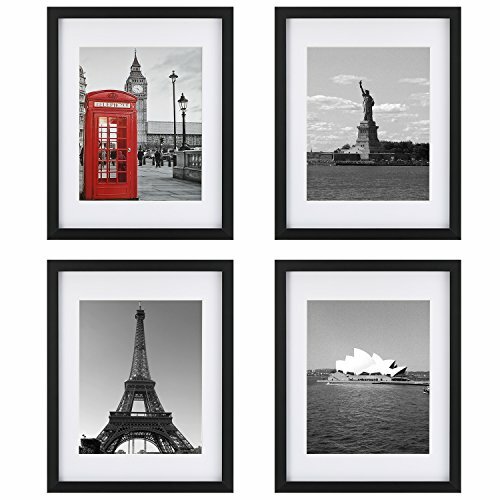 【Modern Style】Understated Black selected pinewood frame plus neatly cut white mats perfectly match any pieces of photos and prints. It also comes with a fine double-sided picture print of Red Phone Booth and Eiffel Tower. 【Suitable for 3 Sizes】ONE WALL black picture frame fits 11×14 inch photo without mat. It comes with 2 extra mats: 7.5 x 9.5 inch opening mat for 8 x 10 inch photo display and 4.7 x 6.7 inch opening mat for 5 x 7 inch photo display. The easy-open tabs on the back enable you to load your photos, prints quickly. 【4 Ways to Display】The pre-installed hanging hardware supports both vertical and horizontal wall display. Our frame can be also displayed on the desktop vertically or horizontally with the built in easel. Besides, the attached bubble level and seamless nail make wall hanging much easier. 【Tempered Glass, Protective Packing】ONE WALL chooses high quality shatterproof tempered glass. And the photo frame is well protected with formed-foam corner pockets, styrofoam, anti-dust membrane, bubble wrap and a box. Order ONE WALL frame with confidence! 【Perfect Decoration】Perfect complements for any featured photograph, artful prints, painting, document or certificate. A great choice for home, office, hotel, restaurant, coffee shop decoration as well as holiday gifts for your friends and families.